Welcome to the annual Weeklies awards ceremony, where you, our beloved and loyal readers (even the ones who complain about us on the internet), vote for the best and worst of the year in a range of exciting categories. It?s just like the Oscars but without the glamour, the free-flowing booze and the actresses in tiny, designer dresses. With the financial crisis biting hard, this year?s virtual awards ceremony is not held in the plush function room of a top London hotel, but in the back room of our local community centre. Try not to anger the teenagers loitering outside. They bite. Nor do we have an exciting special guest such as Jonathan Ross or Russell Brand to hand out the prizes (or insult your daughters/granddaughters) so instead you?ll have to put up with a lowly Cycling Weekly scribe. You?ll find some complimentary eggs and rotten fruit for throwing on each table, along with one glass of warm, unbranded fizzy white wine and a small, mass-produced Christmas dinner with cranberry-flavoured jelly substitute. Times are tough and if it?s good enough for the average company Christmas party it?ll have to do for the celebration of all that?s great (and terrible) about the wonderful sport of cycling. A clear win for our national tour, even if they did let a flamin? Frenchman win it. Not only that but they let a Frenchman who can?t even spell Geoffrey win ? Geoffroy Lequatre. At least British riders were second and third on the podium, well done Steve Cummings and Ian Stannard. We still can?t support the decision to invite Rock Racing?s trio of undesirables nor fathom why the organisers got so excited about offering Alessandro Petacchi his first chance to race after his doping ban. A few people nominated the Somerset stage of the race, which was an absolute belter. No surprise that the Lincoln Grand Prix is there in second place. It is by far and away the most impressive one-day race in the country. Michaelgate should be renamed Downing Street though after the brothers continued their success on the cobbled hill. The National road race was a tactically intriguing affair and it started and finished outside an impressive and imposing stately home, which should have provided a great back-drop. But it was a bit out of the way and the crowds in the finishing straight were small, although the weather didn?t help. It demonstrated the perennial problem of designing a cracking course (which it was) and getting people to come out to watch it. The dusty tracks of the East Midlands Cicle Classic deserve a mention, even if the experience of travelling in one of the team cars that day was a dizzying, disorientating one because the course switches this way and that. I nearly brought up my pork pie. On reader voted for the Tour of Ireland, which we?d like to sensitively point out is not a British race. There have been wars about that and everything. And to the person who voted for the National 12-Hour TT, seek help. Please, make an appointment today. No contest here. The most-watched race of the year also gets the vote for the most exciting. I particularly enjoyed the drama of stages four, six, nine, ten and 20. You can?t beat them for drama. Thanks Riccardo, Leonardo and Mekon-head for them. But seriously, it was a great Tour. Six riders went into the Alps with a realistic chance of winning ? even if one of them was Bernhard ?wide-faced loser? Kohl (although we didn?t know that at the time). The Alpe d?Huez stage as about as tense as it gets. Speaking purely personally, I just don?t get the Giro Love. Every year there?s this great excitement because Zomegnan has found some unpaved one-in-three mountain that leads up to a goat farm where Fausto Coppi used to buy his cheese, and every year a collection of dubious characters make a mockery of the race. This year it was Ricco and Sella. What a farce. Paris-Nice was a super race, though. Short, sweet, without two feet of snow for the first time in five years. The Vuelta got a few votes from a handful of sadists. Why would you put yourself through watching it for three weeks? Someone also voted for the Grande Boucle Feminine ? which wasn?t even the best women?s stage race of the year, even if it did go over some cobbles and up Sestrieres. Paris-Roubaix is going to take some toppling. The race oozes drama and this year was no different with the three main contenders ? Cancellara, Ballan and Boonen ? 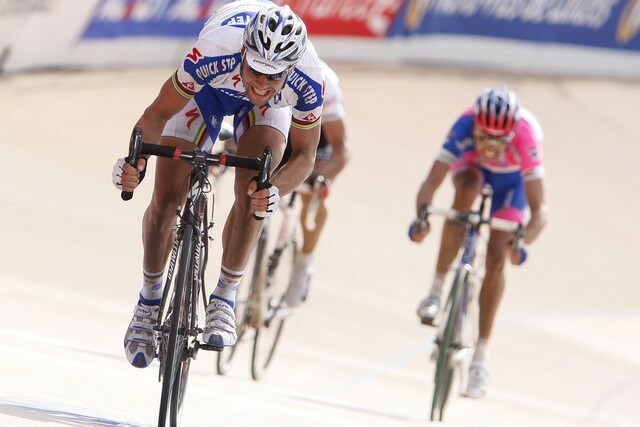 fighting out a tense finish, won by the Belgian, whose year was about to get a lot worse. Great to see Nicole Cooke?s two moments of triumph recognised. They were both very, very exciting races. Some said they best women?s road races ever, but they possessed more drama and ?what?ll happen next?? moments than most men?s races. The moment Cooke disappeared in the tunnel near the end of the Beijing race was the heart-stopping moment of the year. In Varese she applied the same tactical blueprint to a very different race, which showed the depth of her thinking when it comes to racing. Almost all the responses were split between Roubaix and the Olympics. A few mentioned Liege-Bastogne-Liege, which I thought was dreary. The North Road Summer RR for E, 1, 2 and 3 got one vote and I have to agree. It was a thriller. Just remind me who won again? There is a school of thought that says there is no such thing as an exciting time trial. I am not going to comment either way on that one because it gets me into all sorts of problems with people who get up a lot early in the morning than I do. Anyway, the Tour?s final time trial was quite exciting, as long as you totally disregard the fact it was won by Mekon-headed Dr Evil, Stefan Schumacher. The Evans v Sastre battle was gripping. Watching the press room, I was shocked to hear laughter when the French TV commentators said that Cadel?s mother had flown all the way from Oz to surprise her son on his day of glory. Emma Pooley?s ride in the Olympics was cracking, although you?d have had to get up pretty early to watch it. (Ideal for time trial fans). The men?s Olympic time trial was even earlier ? kicking off at 3.30am UK time. That?s early even for the UK testers, who usually set the teasmaid for four on a Sunday morning. Cancellara?s win was no surprise but it was great to watch. Cummings would have been in the top five had his chain not come off twice on the climb. A couple of people voted for the British National Time Trial Championship ? which was actually a complete joke seeing as it clashed with the opening stage of the Tour of Britain meaning David Millar, Bradley Wiggins, Steve Cummings and Geraint Thomas (all potential winners) couldn?t even ride. Sort it out. Some loyal fans voted for the National 10 and National 50. Well, someone has to. And the Giro?s mountain time trial scored a few too. The new event at Blenheim Palace had some support, as did ?my club 10?. Predictably there were also votes for ?none? and ?all are boring?. Again, no comment. A tricky category this, because of the way people interpreted it. Many voted for ?The Olympics? while others voted for specific events. So, what we?ve done, right, is take it as read that ?The Olympics? were the most popular track events of the year and then count the votes for the specific events. The world record-breaking team pursuit ride by Ed Clancy, Geraint Thomas, Paul Manning and Bradley Wiggins (legends one and all) gets the vote, narrowly, ahead of the team sprint gold medal-winning trio of Jamie Staff, Jason Kenny, Chris Hoy (legends one and all). In terms of thrills, though, I can?t believe the Madison at Manchester didn?t win this, because it was the most amazing track race I?ve ever witnessed. The British team was already wiping the floor with the rest of the world when Brad ?n? Cav overcame the odds to win the rainbow jerseys. The roar when they gained their lap had to be heard to be believed. Every Olympic medal-winning ride got a mention, with plenty of support for Victoria Pendleton and loads for Chris Hoy. A few declined to answer, presumably because they are maintaining their boycott of the boards. For the first year ever, though, no one replied with a variation on the theme of ?Track racing is boring?. Truly, progress has been made. The Tour wins again but it?s pretty close. Nicole Cooke?s exploits gain deserved recognition and it?s interesting to see the rest of the vote including track events. ?Would have been Paris-Roubaix but for TV coverage? is an unhappy reminder of Eurosport?s haywire spring scheduling when they like to show exactly the same snooker pictures as BBC at the same time, instead of the cycling. The Lincoln Wheelers hill-climb was in there, holding its own among the Olympic races and the grand tours. And rightly so. A victory for Wales as the Dragon roars loudest. [You do realise the dragon is a fictional creature, don?t you ? Ed] What do you mean? I saw one at London Zoo once, I swear. The Fred Whitton, Etape du Dales and Highclere are all becoming very well-established and respected events but to be fair, this was the most open category of them all, with virtually every leading event getting a mention. Testimony to the strength of the sport. The number of ?none?, ?don?t have one? ?never ridden one? and ?sorry?? type answers indicates that some in the racing community are yet to embrace the idea of cyclo-sportives. Well, I take the point. I mean, the idea of an organised hard ride over 100 miles or so, taking in spectacular scenery and some challenging hills, allowing riders of all abilities to engage with cycling ? Yes, you?re right. What a terrible, rubbish, almost offensive idea. Let?s scrap them all and go back to the 1960s in our time machines. La Marmotte pips the Etape, which may be considered a surprise, until you realise that the Marmotte?s route is truly legendary. It takes in the Croix de Fer, the Telegraphe, the Galibier and then Alpe d?Huez. By comparison, this year?s Tourmalet-Hautacam Etape was a bit tame. Hat?s off to CW?s deputy editor Simon Richardson who rode both events, which were held on consecutive days, as part of the Rapha-inspired Crazy Bet Challenge. The Tour of Flanders is a great day?s riding too and popular because of it?s easy to get to and can be combined with watching the pro race. A sprinkling of Italian Gran Fondo events get a mention, although the vast majority of events were for the two French giants. I?d like to mention the 250-kilometre Paris-Roubaix ? so tough they only hold it every other year. Whoever voted for the Northern Rock Cyclone needs to be made aware that although Geordies may speak a bit funny, it?s not actually a foreign country. A runaway victory for Mark Cavendish, thanks to his two Giro stage wins and four at the Tour. You almost have to pinch yourself when typing that A British rider won four stages of the Tour. Still, it?s good to see that despite all the success some British fans are still not happy. Anyone who said: ?Yeah but he didn?t actually finish t?race, so it doesn?t mean anything? really, really needs to wind their neck in. Or learn a bit more about the sport. Chris Hoy?s three golds at the Olympics give him second place, and Nicole Cooke is a close third. Russell Downing was narrowly behind Cooke in fourth place after utterly dominating the domestic scene, almost winning the Tour of Ireland and being the only Brit to finish the men?s road race at the Worlds. The ony other riders get a vote were Steve Cummings, Ben Swift, Malcolm Elliott, Emma Pooley, Chris Froome, Bradley Wiggins and Jason Kenny. Dan Martin also got a vote, although he?s Irish now. 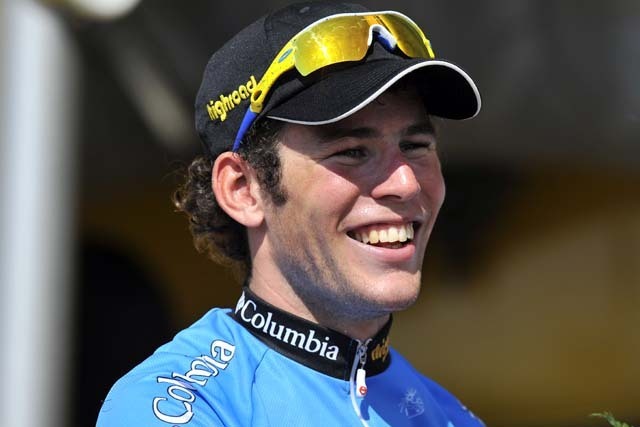 Another convincing victory for Cavendish over Cooke. If this was a real awards ceremony and (heaven forbid) Cav was unable to make it, we?d be looking a bit silly right now. Alberto Contador picked up a couple of grand tour wins this year, which wasn?t bad, I suppose. After that there?s not much to split Andy Schleck, Russell Downing and Fabian Cancellara. Alejandro Valverde and Danilo Di Luca got a few votes, disappointingly. Christian Vande Velde, Carlos Sastre and Paolo Bettini did okay too. Very poor show for the reigning Tour de France champ though. Mind you, it could have been worse. Poor old Cadel barely figured. Why is he so unpopular? He was second in the Tour, for goodness sake. A landslide for Fab. The most prominent chin in cycling is the best time trial rider in the world, as he proved in Beijing, although he lost both Tour de France time trials and skipped the Worlds. Dr Hutch was a distant second, and we?re pretty sure people were voting for his time trialing abilities rather than his Cycling Weekly column. Emma Pooley?s ride in Beijing was a surprise to anyone who hadn?t been paying very close attention. Behind the scenes, British Cycling worked very hard on her time trialling and it paid off with a silver medal. Or rather ?dishonourable mention? in Stefan Schumacher?s case. Nine people voted for the disgraced drug cheat. Come on guys and gals, didn?t it strike you as a little bit fishy at the time? Ian Cammish and Nik Bowdler got a couple of votes each meaning that even they are more popular than Levi Leipheimer (one vote). Chris Hoy scored the largest number of votes in any category, absolutely romping away with this category. Well, that?s what three Olympic golds will do for you. Victoria Pendleton can feel slightly aggrieved. She is as impressive in her races as Hoy is in his, but because there was only one sprint race for women at the Olympics she was denied the chance to win three golds, which she surely would have done. So let?s all boo and hiss at the IOC and the UCI (yes, even louder than usual) until they reverse this decision. Just about every British track rider got at least a mention, despite Hoy?s dominance, including Sarah Storey, the paralympian whose time in the women?s pursuit would have been good enough for eighth place in the Olympics. There were a couple of votes for Sir Bradley Wiggins too. Unbelievably, given the British success there was still a traitorous turn-coat prepared to vote for Spaniard Joan Llaneras. How could you?! We disqualified Mark Cavendish from this category, even though he is still only 23. The spirit of the competition should be up-and-coming riders, and you can?t really be considered up-and-coming if you win six grand tour stages. We know this will provoke a raft of complaints about allowing the votes for Andy Schleck (who was second in the 2007 Giro) to stand, but we don?t care because we are desensitised to complaints here at CW. Cav?s won enough and he hasn?t got enough arms to carry his fictional trophies home. Anyway, Ben Swift, who won a couple of very big races in Italy and secured a contract with the Russian Katusha squad gets the nod over Andy ?The Beast? Schleck, who we all hope will trounce Armstrong at the Tour. 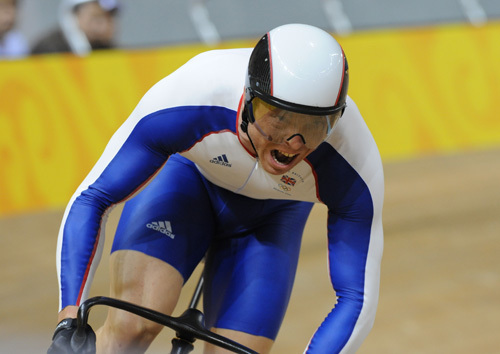 Jason Kenny?s gold and silver in Beijing net him third place. No surprise that the Brits do well here with Jonathan Bellis, Ian Stannard, Alex Dowsett, Luke Rowe, Steven Burke, Lizzie Armitstead and Shanaze Reade all scoring well. For Jonny Foreigner, Dutch motorbike Martijn Maaskant (fourth in Paris-Roubaix), Nicolas Roche and Dan Martin of Ireland and Edvald Boassan Hagen were well supported. We counted every wonderful spelling variation of Boasson Hagen?s name. We think the person who voted for Julia Roswell meant team pursuit world champion Jo Rowsell and we have to point out that Russ Downing is 30, which rather rules him out of the young rider category. Although now you mention it, don?t policemen look young these days! What are you lot on? Enough gold medals from the World Championships and Olympic Games to melt down and rescue the British economy from certain doom and you vote for Dr Evil?s international collection of PR-schooled non-personalities? I mean, what did CSC riders actually win? Well, apart from the Tour de France and two stages, Tirreno-Adriatico, Milan-San Remo, Criterium International, five national titles, the Olympic Games time trial and the Tour of Poland, what did they actually win? It has to be Great Britain hands down, surely? Columbia?s 70+ race wins gets them third place. What more do they have to do? A predictable amount of support for the Princes of Darkness, Astana. Good support for Garmin (despite the argyle thing), a mention or two for Pinarello and Rapha plus some loony who voted for Lampre. Give us a break. Four Tour stages? Yeah, it?s okay, but he?s never going to win the Tour de France king of the mountains is he? So goes the argument of a (thankfully) very small number of oddballs. 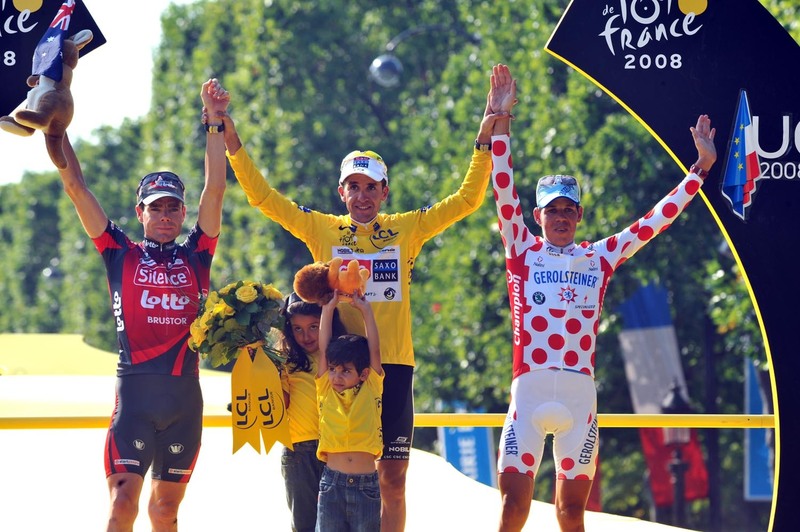 Contador?s two grand tour wins meant he completed the set inside 14 months. Even that?s not enough to convince Johan Bruyneel, though. Plenty of support for Cooke and Downing on the home front. Cancellara is never anything less than impressive. Ballan got a few votes. Cadel Evans didn?t. Poor old Cadel. Once again the CSC effect means that Cervelo?s superb range of top-end bikes get a lot of support. Where do you all get the money from? As someone who has very much enjoyed riding a Pinarello this year, it?s good to see the Italians in second place, with Specialized, last year?s winner in third. A huge number of votes for ?my one? or ?mine?. It?s great to know so many of you love your bikes but it would help us if we knew what sort it is you?re riding. A lot of votes for Focus and Felt plus the usual support for Trek. To the guy who voted ?Felt ? Phwoaar?, get a room. 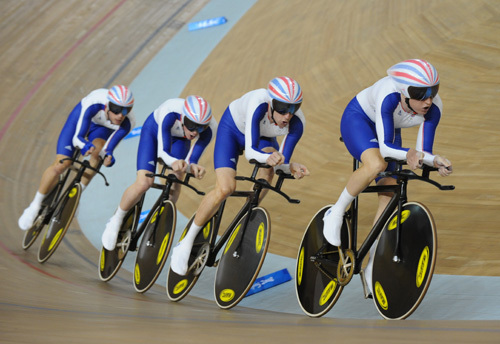 Love the vote for GB team track bike. Like you pop to the shops on it do you? There was me thinking that ten sprockets was more than enough, Campag go and win the arms race to 11. Why? Is it really necessary? When I built my first bike (in 1988) it had six sprockets and my dad said even that was too many. Whatever, if you?ve got a spare couple of grand knocking about, why not? It?s certainly given the Italians the edge over Shimano, whose big recent innovation is to go electric. To be honest, I am waiting for electric cranks that kick in when the gradient goes over eight per cent. SRAM, the new kid on the block, has a lot of making up to do, even if Lance is going to be riding their stuff next season. A vast array of bits and pieces got you excited this year, including a nice affordable set of Zipp 404 Powertaps, the solid, dependable Rolls saddle, Look?s Keo pedals, Rotor?s Q-rings, FSA?s bars, Bontrager?s race lite tyres (?not a puncture in 2000 miles?) and Gore?s waterproof jacket (?It got a lot of use?). Oh, it seems you love Campag?s new 11-speed set-up. Eleven, it?s the new 10, which was the new nine, etc, etc. Where?s it going to end? With cassettes that stick out into the middle or the road, or chains the thickness of rice paper? 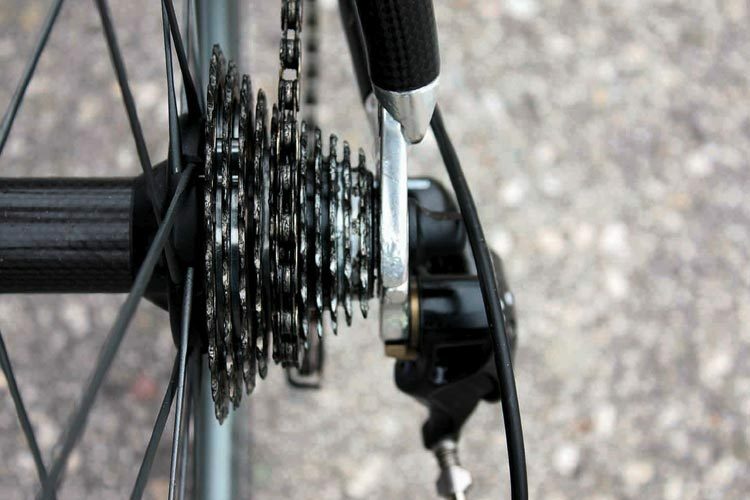 Shimano?s electric gears are very popular despite the problem of where to carry the remote control when riding if your pockets are already full of gels, bars and inner tubes. Garmin?s 705 is a pricey bit of kit but it?s fantastic. Oddly, apart from me, the response in the CW office has been a bit lukewarm. They can?t see the point of logging and mapping every ride, counting calorie consumption and metres of climbing. I mean, what?s the matter with them? A lot of people didn?t really give this category much thought. Many left it blank. Several voted for ?The CERA EPO test? and variations on the same theme. Good on you. A few voted for independent anti-doping systems and a few voted for the decision to scrap the time bonuses at the Tour de France. CSC?s design was quirky, with the black section at the bottom actually being made up of each rider?s signature. I?m not making this up, have a close look for yourself. Riis? design team will no doubt be Tippexing over the words IT Factory on the 2009 jersey. Caisse d?Epargne and Rapha are joint second, proving that all the cool kids wear black, although it?s advisable to be visible on the roads at all times. Columbia?s blue isn?t to everyone?s taste so perhaps its popularity is due to the belief that after so many wins, perhaps the material contains a magical power. Quite why anyone likes the Rock Racing jersey I don?t know. It makes you look like a thug from an LA gang. It?s like a very bad tattoo chosen by someone who?s just been released from prison. And it?s lime green for gawd?s sake ? the least cool colour ever invented. Plus the jerseys are very expensive. Garmin?s argyle has plenty fans, presumably among golfing cyclists. We can?t confirm whether those who voted for the Team GB skinsuits did so while drooling over a picture of Vicky P or Chris Hoy, although we have ours suspicions. Pink and baby blue is a winning combo for fans of Plowman Craven, although you wouldn?t wear it out in public, would you? There was a vote for ?Team GB ? why don?t they market it?? Why indeed. And also for Sky+HD?s moody black and blue number. Then there?s a few sticking up for Francaise des Jeux (what? Even the white see-thru shorts? ), Quick Step and Silence Lotto. Thankfully Astana?s hideous jersey didn?t do well and presumably the person who voted for Gerolsteiner has now cut up the jersey to use it as dusters. Slightly surprising, considering the number of categories Cavendish won, that Hoy wins the Hero of the Year title. It was closely contested though. Dave Brailsford, Shane Sutton, Tour boss Christian Prudhomme, the guy who developed the CERA test, Wiggo, Aileen McGlynn, the Paralympians, Robin Fox Solihull youth coach, Jonathan Vaughters, all drug-free anti-dopers, John Grimshaw of Sustrans and Lance Armstrong all got a vote or two. Lance? Really? For what? No contest. The bleached-blond bad boy who cited Pantani as his hero and climbed mountains on the same fuel brought the Tour into disrepute and rendered his second place in the Giro irrelevant after testing positive for CERA EPO. Yeah, nice one chump. Schumacher ditto. Lance?s comeback hasn?t gone down as well as he might have expected either. Why couldn?t he have left it alone. Pat McQuaid, ASO, any dopers, Schumacher and Kohl dumb and dumber, Cadel Evans (? ), Dmitriy Fofonov, Manuel Beltran all figured. We also got one response which said ?That young Italian t***? which we presume meant Ricco. ?Landis will always for ever be the villain? was another. Rock Racing, Emanuele Sella, ?so many to choose from?, were others. Then we had the rather objectionable ?All Germans?. Some people just can?t let it go can they. And we?d have been disappointed had we not had the most predictable of all ?Robert Garbutt ? for destroying Cycling Weekly?. Not really, we?re still here, more than a 100 years on the clock, and sales on the up. Not too shabby, ta fella. And so we finish on a high note with a category that Cycling Weekly is guaranteed to win, no matter how many critical emails we get! The Olympics were a two-week period where anyone who was involved in cycling whether as a fan or spectator or journalist just a decade ago could scarcely believe the level of success. My anecdote about seeing Chris Hoy, Craig Maclean and Jason Queally win the Olympic sprint (for that is what the team sprint used to be called) silver at the 1999 Berlin Worlds is wearing so thin now, but think back to that, when a silver or bronze medal only came along every five years or so. Of course we STILL get emails saying we didn?t put Nicole Cooke on the cover after her win, when we quite clearly did. 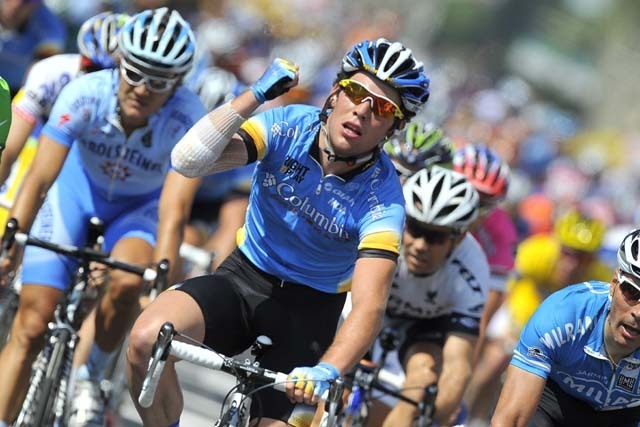 Lance?s comeback was eagerly received and it is, without doubt, going to be the story of 2009. And our Tour coverage has plenty of fans, including that said: ?The Tour preview ? like a bible?. Thanks for that. ?None, your covers are poor and self-indulgent?. Thank you, sir. ?They were all amazing and you couldn?t single one out.? It?s better to get extreme reactions than none at all. ?Any sportive? and ?none with a sportive? cancel each other out. ?The one the other week, you know, with wotsit on his bike? ? and we thought you were going to be specific! ?Lance coming back, WHOOO!!? and ?anything except Lance? seems to cover a broad range of opinions, ?the one without a CW staff ? was there one?? and finally, I?ve kept my calm, but I?d really like to have a stern word with the numptie who wrote ?anything not fawning all over Cavendish?. You mean the bloke what won four Tour stages? Yeah, probably best to just ignore him, eh. So, ladiesungennerman, thank you ever so much for attending. We hope you?ve enjoyed yourselves. Ordinarily there?d be a bit of a disco now but we?re going to turn the lights off to save the electricity bill so if you could all collect your coats from the big pile out next to the bins and toddle off home, we?ll bid you goodnight. Thanks again, see you in 2009.